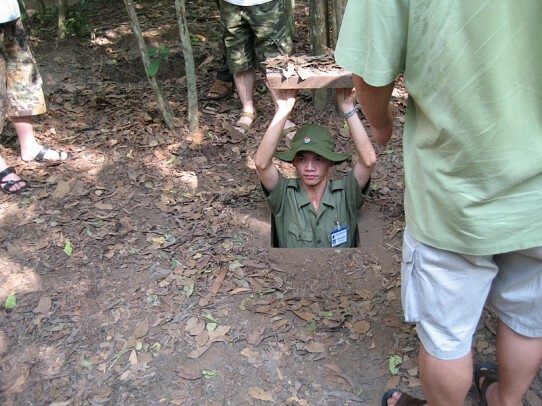 While Sam was recovering from his illness, Ben and I did a tour of the Cu Chi Tunnels. The day started at about 8am. We load onto the back of the bus and it takes us out to an art production factory. The workers here were all affected by Agent Orange, a defoliant that was dropped by the Allied forces in the war. I don’t remember seeing that many deformities, but I remember feeling that the workers were nothing more than human Xerox machines (copying a piece of art over and over). While the works were very beautiful, paintings using crushed shells, sandstone sculptures etc, there was no way I could take something like these home. Midday neared and our next destination was a Chau Dauism Temple. I am not privy to what the religion involves, but I appreciated the colourful nature of the temple and the dress of the attendees. Lastly we arrived at the Cu Chi Tunnels, and so began what I call “ram-rod” tourism. There was a lot to see: traps used by the Vietnamese, underground homes, underground hospitals,a shooting range, and lastly we had a chance to go through the tunnels on all fours ourselves. The tunnels had apparently been made larger for tourists, but is was still very narrow. Having crawled about 80m through the first tunnel, Ben and I took the first available exit. It was hot and claustrophobic. Only the very determined would go right to the end. A very sweaty day, but well worth it.